A war has been brewing for years among designers. That’s right, it has. In fact, you may have already chosen a side and don’t even know it. This war can divide or unite us and, at the very least, prompt some really interesting conversations. If you want to see where loyalties lie, simply ask a group of designers the question, who has better vector tools, Photoshop or Illustrator? Now, in reality, the answers you receive will likely be more than a little biased based on where the designer spends most of their time. If you’re a print designer, more than likely your answer would be Illustrator. If you are a web or UI designer, you’d likely say Photoshop. 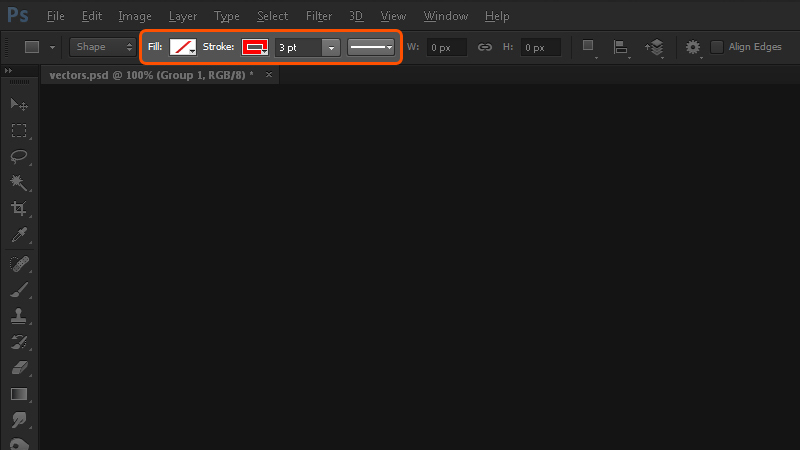 Regardless, it’s easy to see through recent Creative Cloud updates that Adobe has identified the vector toolset inside of Photoshop as one that can use some improvement. More on that in a moment. Why Are the Vector Tools so Different from Application to Application? This is a question someone new to these applications has inevitably asked in frustration. If you can quickly and easily round the corners on a vector shape inside InDesign, why can’t you do the same thing in Photoshop and Illustrator? The truth is that each of these applications were designed with a specific purpose in mind, and the vector tools were developed based on what was believed to be needed. Photoshop had the most slimmed down implementation of vector tools simply because it was thought they wouldn’t be relied on as heavily as with Illustrator or InDesign. Did all the web designers just groan? The great news is that right out of the box with Photoshop CC, the vector tools already have a number of great improvements. For example, the ability to control things like the stroke or fill right from the Control Panel or the ability to select multiple paths is absolutely huge. This change in and of itself feels more like the way colors for vector shapes work in both Illustrator and InDesign. While obviously still different, many of the changes taking place in Photoshop seem to be focused at unifying the way vectors work across the different software. This is a gradual effort, but it’s not hard to see the evolution of vectors in Photoshop over the last couple of versions. When it comes down to it, Illustrator and InDesign have an unfair advantage over Photoshop. Besides the fact that they were built as vector applications from the ground up, they also possess robust Stroke and Color or Swatch Panels that provide an enormous amount of control over a selected vector shape. With a recent Creative Cloud update, Photoshop now has an answer to this. 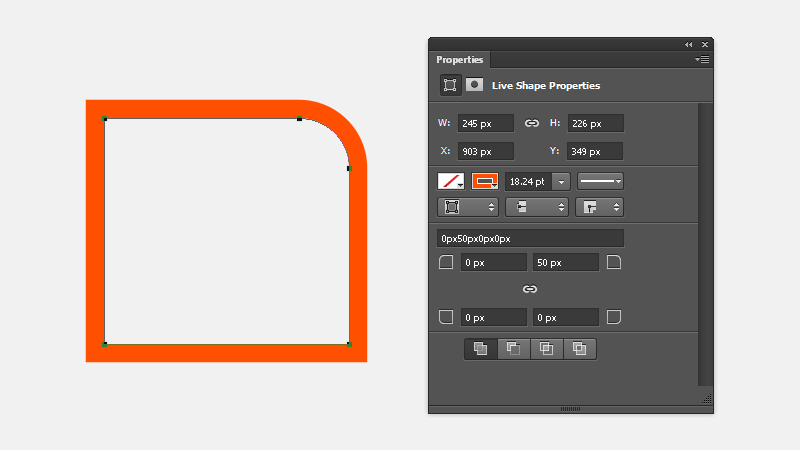 It’s known as Live Shape Properties and they can be found, you guessed it, in the Properties Panel. Here, depending on what type of vector you select, the Properties Panel evolves to display relevant Live Shape Properties for that vector. Remember, you must select the vector with either the Path Selection Tool or the Direct Selection Tool though. Let’s say you select a vector shape layer. Here you’ll find a plethora of wonderful options related to not only the vector shape, but also it’s usage as a mask over its Fill Layer. If you select a simple vector shape that isn’t attached to a fill layer as a mask, you’ll just get the Live Shape Properties. If you’ve examined the image above, a keen eye will have noticed that you now have quick and easy control over the rounding of corners on a shape. After seeing the number of updates that Adobe has released since the release of their Creative Cloud software and what those updates have meant for Photoshop, it’s clear that the vector playing field is starting to equalize. If you’re interested in checking out some of the new vector features inside of Photshop CC, make sure you check out this introductory Photoshop CC tutorial and more Photoshop tutorials.